This is still the work of an inexperienced writer. Comparing The Outlanders to the work I’ve done more recently, I still cringe a little at the habits of that younger me. But I also see growth, a writer beginning to master elements of his profession. And, to my surprise, I see as well things that I need to be reminded of today as I think about where I ought to go next with my career and my craft. 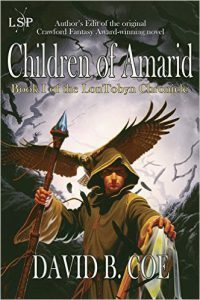 Today’s Quick-Tip Tuesday post at Magical Words again discusses my revisions of my first series, the LonTobyn Chronicle, and what I have learned from that younger version of myself. It’s not just a matter of correcting youthful mistakes; at times, I’m finding that I need to emulate more some of the things I used to do. Sounds interesting, right? Then read the post! You can find it here.